Dedicated to helping you grow as an athlete and as a person. World-Class Martial Art Instruction In Foley! Get Started Today! Request Information Now! Learn from the best Martial Arts instructors in the area who are dedicated to providing a stable, family environment where you can excel in your personal goals and find a varied and supportive community. Whether your plan is to compete, lose weight, meet new like-minded people or increase your day-to-day life, we will help you get there faster than you ever thought possible while having fun doing it! The benefits of Martial Arts classes are endless. 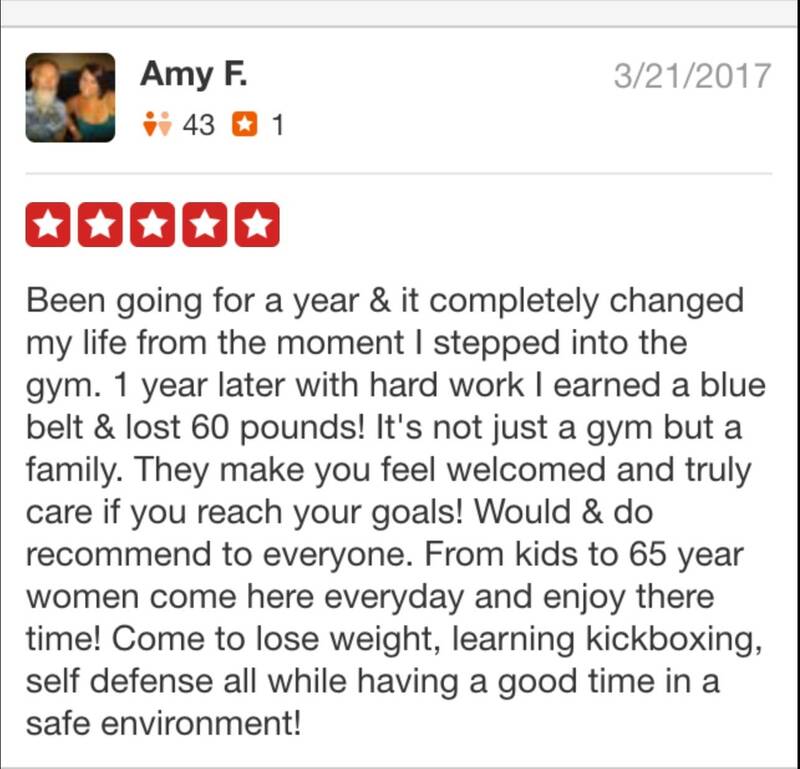 From confidence and self-esteem to discipline and empowerment, whether you're enjoying or Kids Martial Arts classes or our Adult programs, you'll start seeing improvement in mind, body and spirit in only a few short classes. GET STARTED TODAY by clicking the button below! Our expert instructors teach you and/or your child valuable life skills such as confidence, discipline, self-defense, goal setting & leadership to push you to reach your goals! Our core values are built upon hard work and respect. We create a healthy & safe environment and mentor our clients to take personal responsibility for their results. We are committed to providing innovative, relevant, sustainable and accessible Martial Arts and Fitness programs that empower our students for life. Kids Martial Arts classes at Roufusport Foley are the ultimate in self-defense and bully-prevention! Each student in these exciting sessions will become well-rounded both as a martial artist and as a person. Have you been looking for an exciting, upbeat workout that will get you into the best shape of your life? If so, look no further than Roufusport Martial Arts Academy in Foley! These workouts focus on high intensity interval training with bag drills, pad drills, partner drills, focus mitts, floor exercises, games and more. 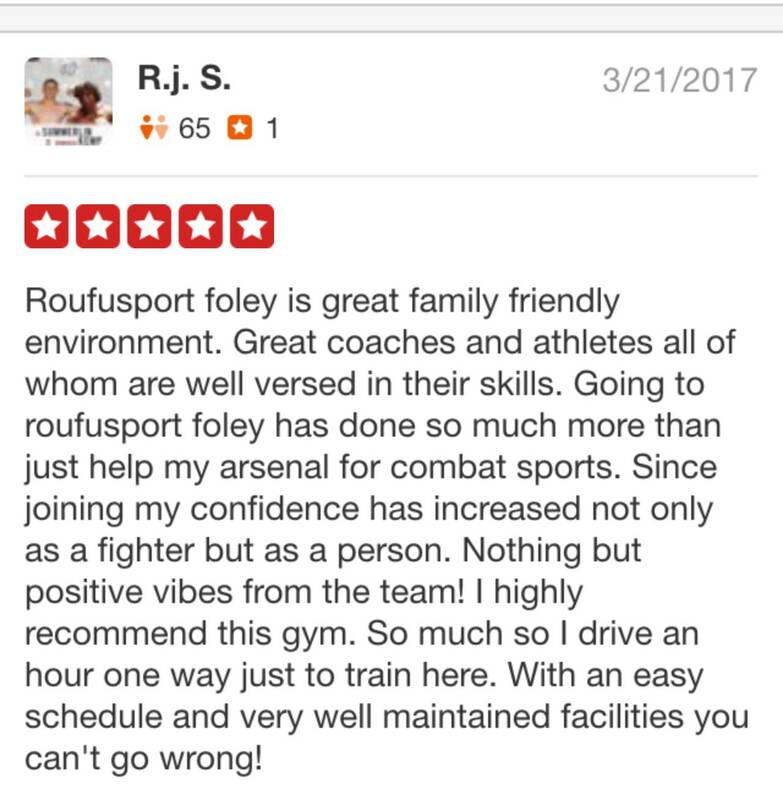 Adult Martial Arts at Roufusport Foley has something to offer everyone! Between Brazilian Jiu Jitsu, Kickboxing and MMA, you can be sure to find the martial art that best suits your fitness goals. There are a wealth of benefits that come from healthy self-confidence from helping you manage fears and maintain a positive mental attitude. Train with us and you'll discover there is no better way to build your confidence then with the Martial Arts. With self-discipline comes all kinds of beneficial improvements to your life including advanced focus, new found respect, better health & fitness along with having an easier time at work or school. The bedrock of Martial Arts is founded on teaching discipline and self-control to its students. Knowledge of Self-Defense produces advantages far beyond looking cool and hoisting trophies. With these skills you'll learn to defend yourself in a variety of situations, whether life-threatening or you're being bullied in school. Not only that, but you'll gain the confidence to use - or not use - these skills to keep you and your family safe. Our team is dedicated to your success. Whether that means pushing you to your limits, being a friend in a time of need or spending extra time to show you a technique you're struggling with, our community is here to make you feel comfortable and safe while having fun and learning effective techniques. Awesome atmosphere! Great instructors and coaches!